Hello! Welcome to Day Two of our New Hampshire Vacation. On our second day we woke up at the crack of dawn and dressed for some serious hiking. 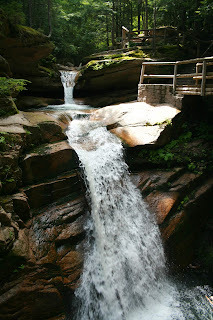 We knew this was our last day to explore the White Mountain National Forest, so we packed a lot of activities into this day, and thus there will be multiple posts to cover just one day's events. Our daughter Ashley had a full day of rehearsals, so she wasn't able to be with us, that is why you will only see pictures of me and the 'boys' for the next few posts. 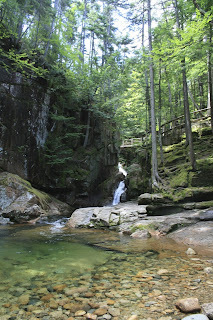 The first place we visited on Day Two was Sabbaday Falls. It is a beautiful, shaded, easy hike to the falls and the trails are very well maintained compared to most of the trails in the White Mountain National Forest. These falls have three drops and pretty pools and a pothole at the end formed by the swirling waters and sand. 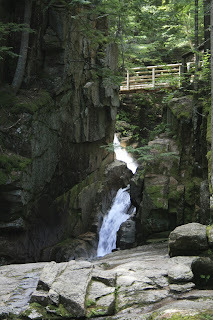 There were many rustic, attractive bridges and walkways to get above and around the various falls for easy viewing. 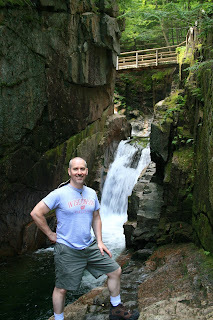 This is a picture of me as we just started the hike to the falls. Doesn't that look like a lovely place to take a morning walk? 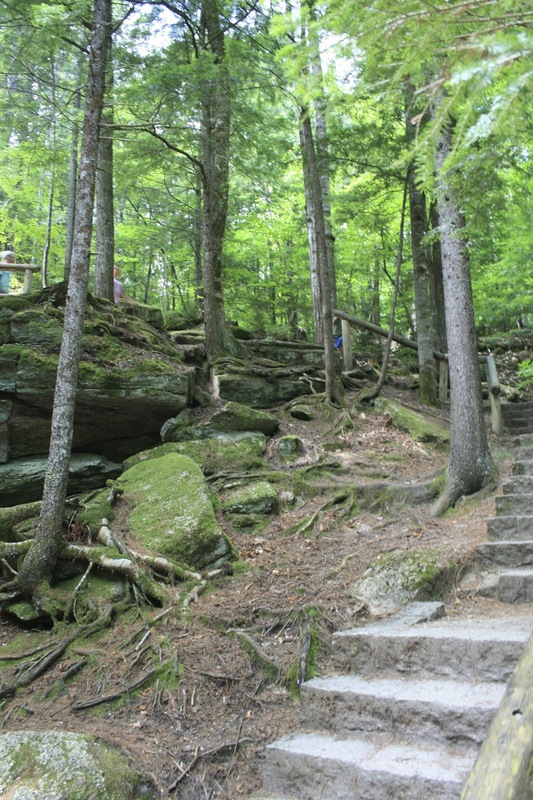 The path is handicapped accessible and also perfect for young families with strollers or for the elderly who prefer a less strenuous hike: or for anyone who wants to be out in nature but may be physically limited to what they can explore. This is one of the pretty bridges across the falls. 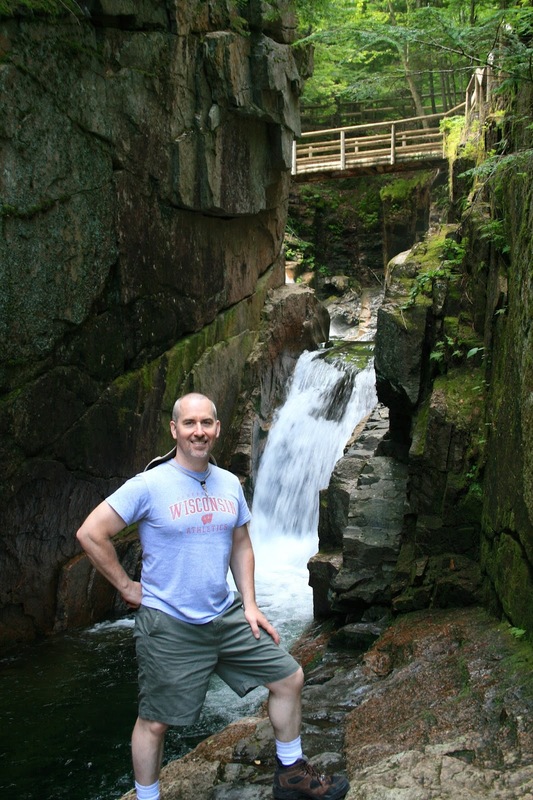 It is a mere 0.3 mile hike from where you can park your car to the falls, and the trail is filled with many pretty spots to stop and take a picture like the one of my husband on the rock below. 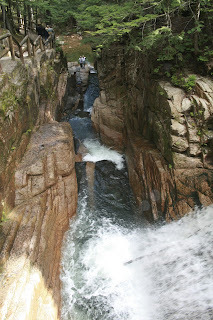 Many of the bridges overlook the rushing water so that you can get really close and see it's force. Even though it's a small waterfall in comparison to others in the forest, the water actually falls and flows through a very narrow gorge which makes it very forceful creating a lot of white water. This picture is taken at the very top of the side of the first fall. Can you see the people in the pool below? One of the smaller falls as you near the bottom and the water begins to quiet down a little. A bridge/path overlooking the small fall pictured above. Here is the third drop in the falls. The total drop of these falls is thirty five feet. And finally, the view of the falls from the bottom. It's impossible to get the entire view of the total falls because it actually takes a very sharp turn at the top, so the most of the falls one can get in a photograph is the bottom two drops. A close up of my husband at the base of the falls. 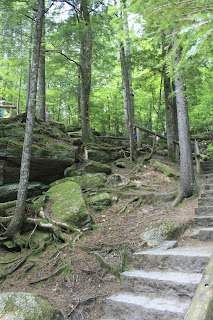 A view of one of the many pretty stone paths leading to the falls. Wonderful shots Amy ! superb place ! Fabulous scenery Amy, what a great area to visit!